“Captain Marvel” continues to dominate the box office in its second weekend, topping the charts with $69 million grossed domestically and $119.7 million grossed overseas. While the domestic total was a 56 percent drop from the film’s $153.4 million opening weekend — larger than the 43-44 percent drop for “Black Panther” and “Wonder Woman” — it still sits only behind 2017’s “Beauty and the Beast” ($90 million) on the all-time list of second weekend totals in March. With $189 million grossed worldwide this weekend, including $12.5 million from IMAX screens, the film now has a global total of $760 million, surpassing the $623 million global run of “Ant-Man & The Wasp” in less than two weeks. In second is Paramount’s “Wonder Park,” which is opening to $16 million from 3,838 screens. That’s higher than the $10-14 million start projected by trackers, but with a budget reported to be as high as $100 million, this animated film faces a long road to profitability. Still, Paramount is hoping for a strong hold as kids head out of school for spring break in the coming weeks. The film has a weak 30 percent Rotten Tomatoes score but has a B+ from audiences on CinemaScore. In third is CBS Films/Lionsgate’s “Five Feet Apart,” which is opening to $13.1 million from 2,803 screens. Made on a $7 million budget, the film was projected for a $7-10 million opening but has performed well with female audiences, who comprised 82 percent of the total audience and gave it an A on CinemaScore. Critics were more lukewarm with a 53 percent Rotten Tomatoes score. Universal/DreamWorks Animation’s “How to Train Your Dragon: The Hidden World” is in fourth with $9.3 million, bringing its total to $135 million after four weekends, while Lionsgate’s “A Madea Family Funeral” is in fifth with $7.8 million and a $58.8 million total after three weekends. Outside the top five, Lionsgate/Pantelion’s “No Manches Frida 2” hit theaters with a targeted release of 472 screens, grossing $3.7 million and matching the opening of the first “No Manches Frida” in 2016. In seventh is Focus Features/Participant Media/Amblin’s “Captive State,” which opened to $3.1 million from 2,548 screens but has been received poorly with a C- on CinemaScore and a 46 percent Rotten Tomatoes score. Lastly, Warner Bros.’ “The Lego Movie 2” finally crossed the $100 million mark in its sixth weekend in theaters, grossing $2.1 million to take eighth on this weekend’s charts and bring its domestic total to $101.3 million. By comparison, the first “Lego Movie” grossed $236.9 million after six weekends, putting the sequel 57 percent behind the original’s pace. 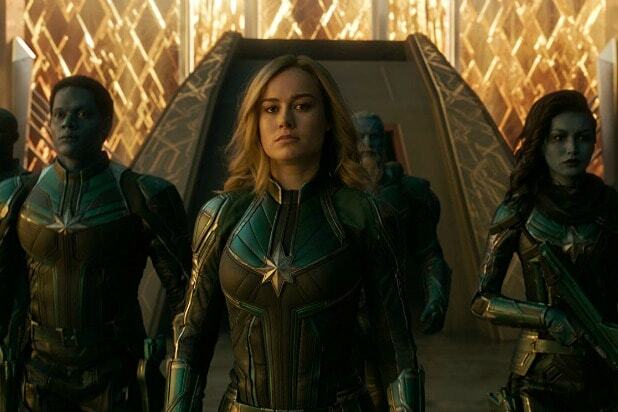 Next weekend will likely see “Captain Marvel” cede the No. 1 spot to Universal/Monkeypaw’s “Us,” Jordan Peele’s follow-up to his Oscar-winning “Get Out.” The film’s release was pushed back a week to allow buzz to grow from its world premiere at SXSW, where it received a standing ovation and unanimous praise from the critics in attendance. “Us” is currently projected for a $40-42 million opening, which would be an improvement on the $33.3 million opening of “Get Out” in February 2017.